Paul Joseph Otto Johansson (born January 26, 1964) is an American actor and director in film and television, best known for playing Dan Scott on the WB/CW series, One Tree Hill, and for his role as Nick Wolfe on the short lived Highlander: The Series spin-off Highlander: The Raven. 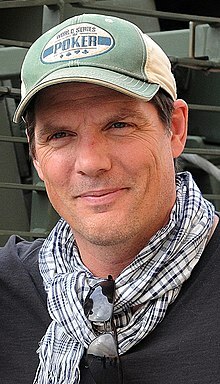 He directed the 2011 film adaptation of Ayn Rand's novel, Atlas Shrugged: Part I.
Paul Johansson was born in Spokane, Washington, the son of ice hockey player Earl Johnson, but raised in Kelowna, British Columbia He was an athlete like his father and played for the Canadian Olympic Basketball Team and for the University of British Columbia. After quitting basketball he began writing, which in turn led to acting. Johansson landed his first role on the soap opera Santa Barbara. He played Greg Hughes from 1989 to 1990. Soon he made appearances in other television shows such as Parker Lewis Can't Lose and Beverly Hills, 90210, and later recurred on Lonesome Dove: The Series and starred on Lonesome Dove: The Outlaw Years. Johansson became well-known to fans of 90210 for playing John Sears, a fraternity brother who unsuccessfully vied for the affections of Kelly Taylor (Jennie Garth) and set up Steve Sanders (Ian Ziering) to burglarize a professor's office. The character returned for the season 4 finale. He also appeared in commercials, most notably as the delivery man in a Diet Coke commercial. He has appeared in the films Soapdish, John Q and Alpha Dog and had a small role in The Notebook. He portrayed the role of Dan Scott in One Tree Hill beginning in 2003 until the show's end in 2012. He subsequently featured in Takashi Miike's 2003 film Gozu, appearing as a man with a cow's head. In 2003 Johansson wrote and directed the film The Incredible Mrs. Ritchie. He has also directed several episodes of One Tree Hill. In 2006 he starred in Emily Skopov's Novel Romance, alongside Traci Lords and Sherilyn Fenn. He appeared in the 7th season of The Drew Carey Show, playing a sportscaster. He is the director of Atlas Shrugged: Part I (2011), the first third of a proposed trilogy based on the novel by Ayn Rand. The film received a "13% Fresh" rating on Rotten Tomatoes, indicating that only five of thirty-nine reviewers liked it. Johansson's ex-wife is actress Gabriela Oltean. His mother, Joanne Leone Johansson, died on October 14, 2011, after a 20-year battle with breast cancer. Season 9, episode 11 of the CW's One Tree Hill (titled "Danny Boy", in which Paul's character Dan Scott dies) was dedicated to her memory. His brother Pete Johansson is a well known comedian, writer and actor currently living in London, England. He has a son named Quinn. ^ MICHAEL M. GRYNBAUM (11 May 2016). "Movies". Retrieved 12 May 2016. ^ Chocano, Carina (28 April 2011). "'Atlas Shrugged: Part I,' Ayn Rand's Opus - Review" – via NYTimes.com. ^ "Paul Johansson Biography (1964-)". Retrieved 12 May 2016. ^ "pauljohanssononline.com". Archived from the original on 8 September 2012. Retrieved 12 May 2016. ^ "Paul Johansson". TVGuide.com. Retrieved 12 May 2016. ^ "Atlas Shrugged: Part I". 15 April 2011. Retrieved 12 May 2016. ^ "Joanne Leone JOHANSSON's Obituary on The Province". The Province. Retrieved 8 December 2016. ^ Murty, Govindini (July 21, 2010) Libertas Film Magazine Archived 2010-08-01 at the Wayback Machine "EXCLUSIVE: LFM Visits the Set of Atlas Shrugged + Director Paul Johansson's First Interview About the Film". Libertas Film Magazine. Retrieved 2010-08-16.